GOLD MINING output worldwide is running more than 4% higher than previously estimated according to leading analysts, thanks to a boom in so-called "informal" projects across developing economies. With total world gold mine output recording a 10th consecutive year of growth in 2018, and its 9th new all-time high, specialists analysts Metals Focus this week announced a "fairly substantial revision" to their estimates for artisanal and small-scale mining (ASM). These often illegal and highly dangerous projects produced around 550 tonnes of gold in 2018 according to Metals Focus' new figures, some 15% of total global output. Together with other revisions, the extra ASM output adds more than 730 tonnes to Metals Focus' prior 2010-2018 figures, nearly 2.7% more than last year's estimate for the decade so far. The size of Metals Focus' revisions grows across its annual data series, rising from 33 additional tonnes in both 2010 and 2011 (then 1.2%) to more than 200 tonnes on 2018's output (some 6.3%). Presenting the data at Tuesday's launch of the new Gold Focus 2019 report in London, the consultancy's head of mine supply Mark Fellows said that these revisions to Metals Focus' previous ASM estimates come from cross‐referencing data from local governments, export figures, development agencies and NGOs, as well as from personal contacts on the ground. Booming ASM production is one of "several important long-term structural changes" to the global gold-mining sector, Fellows went on. The developed West's top 10 stockmarket-listed gold miners now account for just 25% of annual world output, falling from 38% in 2010, as they try to pay down debt by selling assets bought at the peak of the sector's M&A frenzy when gold prices peaked in 2010-2012. Less affected by that legacy of debt and mal-investment, mid-tier mining corporations are meantime growing their output, and top 5 producer nations Australia, Russia and Canada are seeing an exploration "boom", with their annual output already rising last year by 7.6%, 5.9% and 10.4% respectively – encouraged by lower costs due to weakness in their domestic currencies versus the US Dollar. 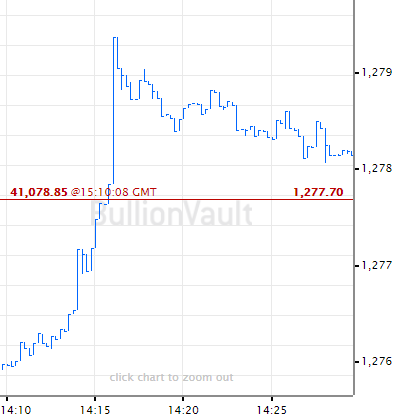 The decline in gold output from former No.1 (and now No.9) South Africa has "accelerated", Fellows said. 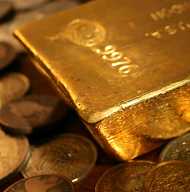 Yet thanks in good part to the surge in ASM activity, the continent of Africa has enjoyed the world's top regional growth in gold-mining output since Metals Focus' data series begins in 2010, adding an extra 240 tonnes per year even as S.Africa's annual output has shrunk by 80 tonnes. Alongside the underlying uptrend in world gold prices, the rise of ASM has been driven by population growth and a lack of economic opportunity outside subsistence farming, Metals Focus says, plus the arrival of mobile phones (for pricing, agreeing deals and receiving payment) and growing demand from the global gold refining industry, with "middlemen" now going in to finance new projects. For 2018 alone the revision to ASM estimates almost doubled Metals Focus' full-year figure for east African nation Sudan to nearly 77 tonnes, Fellows said, and it grew the year's full global gold-mining total by 4.2%. South Africa's gold reserves are being "looted on an industrial scale", says the country's Sunday Times, repeating a claim that formally legal sites now worked and subject to murderous turf-wars by 'Zama zama' miners leaves $1bn of metal unaccounted for each year in the official trade statistics. A separate report says more than 2,300 illegal mining sites now dot the Amazon region of South America, with 245 large-scale projects building "sophisticated infrastructure, tearing down native forests and contaminating rivers with mercury as they dredge for gold and extract diamonds and coltan...used to make mobile phones." Second only to China as a gold-consumer but with zero domestic mining, India is making a push to import doré – an alloy usually of gold and silver produced at the minehead – rather than bullion bars, charging 0.65% less in duty to boost its domestic refining industry. Almost half of all gold and silver doré imported into India in 2018 came from ASM, reckon Arvind Sahay and Sudheesh Nambiath of the India Gold Policy Centre, writing in the Economic Times. On their research, India imported 75% of Bolivia's total output, 71% of Ghana's and 34% of Peru's. The National Stock Exchange of India (NSE) said last week it will accept domestically-refined gold for settlement against its futures contracts, rather than demanding only bullion bars meeting the internationally-recognized Good Delivery standards of the London Bullion Market Association (LBMA). The LBMA has since 2012 imposed increasingly tight "due diligence" requirements on its approved refiners, adding further environmental, social and governance standards (ESG) to its Responsible Sourcing guidance. 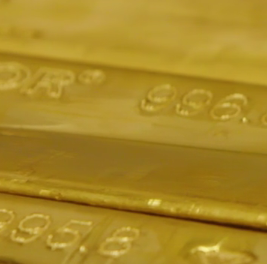 India currently has only one LBMA accredited refinery. Looking at total 2019 world output, Metals Focus believes that China's ongoing enforcement of environmental regulations will continue to hit many smaller producers in the No.1 gold-mining nation – already down 6.9% in 2018 – while the end of open-pit mining at the giant Grasberg project in Indonesia will also hit the global total. 2018 gold production from Grasberg's giant copper-gold deposit jumped almost 75% to 83.9 tonnes – a massive 2.4% of world output and more than twice the next largest project, Olimpiada in Russia – thanks to a bump in high-grade ore from the final stage of its open-pit mining. Exports of copper from Grasberg will drop 85% in 2019 from last year's peak, says Indonesia's Energy and Mineral Resources Ministry, as the shift to block cave mining begins. Against those declines, Metals Focus sees the gold-mining boom continuing in Australia, Russia and Canada – the No.2, 3 and 5 gold-mining nations respectively – while Africa will "benefit from higher production from the ASM sector...also an important area of growth in Central and South America." 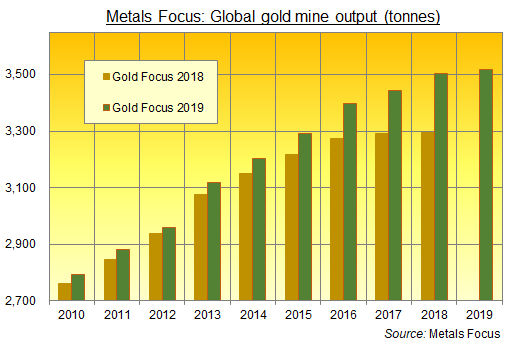 Overall, and having forecast a 2018 drop for total global gold mining output from 2017's then-record high, Metals Focus now sees "further, albeit slower" growth in 2019 with a "more finely balanced" outlook after what in fact proved "relatively robust" expansion last year to a fresh all-time high.